I couldn’t contain my surprise, my brow furrowed and I did a double take. On a road trip, after passing miles of empty fields, I stopped for gas and a refreshing beverage. I was shocked. There it was on the shelf, an entire row of kombucha options. How did this drink get so widely accepted that a random gas station in rural America is carrying it alongside soda drinks, bottled Starbucks coffee, and Red Bull? If you are not familiar with this clearly popular drink, kombucha is a fermented and sweetened tea that tastes somewhere between vinegar and champagne, and has been touted to offer numerous health benefits. This healthy elixir has an ancient history. It is believed that kombucha originated in China, where it has been consumed for around 2000 years. Then it was known as the ‘Tea of Immortality’. The tea has also been consumed in Eastern Europe, Russia, and Japan for centuries. The tea’s name is thought to have come from Japan. A Doctor treated the then Emperor with the tea. His name was Kombu and so this was joined to the word ‘cha’ (meaning tea) to form Kombucha. In the United States, it used to be primarily found in a limited number of health food stores or home-brewed by health-conscientious individuals open to alternative medicinal remedies. Now, it is becoming an increasingly common drink on the shelves across America, consumed by Hollywood stars and seems to be a staple beverage here to stay. What’s Inside this Trendy Elixir? The simple answer to this question is that kombucha is made of tea, sugar, bacteria, and yeast. When these ingredients are fermented it is then mixed with fruit juices or herbal extracts like ginger and bottled to drink. The complicated answer is that kombucha is a complex elixir formed from tea, sugar and a specially grown culture. The culture has been nicknamed SCOBY, which stands for ‘symbiotic culture of bacteria and yeasts’. The SCOBY looks like a beige or off-white rubbery pancake. Due to its appearance, the culture is commonly referred to as a mushroom, though scientifically it is not a mushroom at all. The mushroom looking culture is put into sweetened black or green tea and when left to settle in careful conditions, it ferments and becomes a rich source of vitamins, minerals, enzymes, and probiotics. As the culture digests the sugar in the tea, it also produces organic acids like glucuronic acid, gluconic acid, lactic acid, acetic acid, butyric acid, and malic acid. Ordinarily, fermenting a beverage with yeasts would produce alcohol, but in the case of kombucha, the bacteria in the culture primarily turns the alcohol into organic acids. 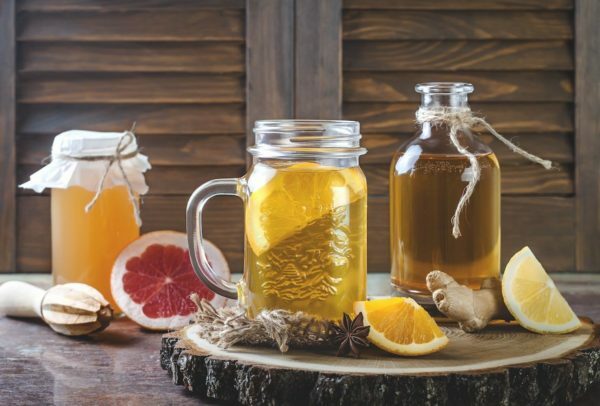 At this stage, many take this potent blend and add juice or herbal extracts to craft unique flavors to increase the appeal of consuming this effervescent tangy drink. This complex, flavorful result is what has become the kombucha we see on the shelves today. The long history of kombucha is primarily founded on the belief that the bubbly elixir has dramatic and significant health benefits. To this day it hasn’t been directly scientifically proven that drinking kombucha heals you. However, components found within the resulting kombucha compound have been scientifically proven individually. So, many believe in the healing power of this potent drink and have gone as far as calling it the “fountain of youth”. Filled with the following healthy components, all with proven health benefits individually, it is fair to say that kombucha is definitely a nutritional powerhouse that is worth trying. Probiotics – Gluconacetobacter, Acetobacter, and Lactobacillus. The process of fermentation with a live colony of bacteria and yeast, works as a probiotic by helping in sustaining the gut health and provides relief from various abdominal disorders including chronic constipation and diarrhea symptoms. The digestive enzymes present in it enhance the effects of glucuronic acid and aid in the breakdown of proteins and saccharides, thereby making the digestive system more efficient. It contains a powerful detoxifier glucuronic acid which binds the toxins by entering the liver and eliminates them out of the body via kidneys. This helps in reducing the burden on the pancreas and keeps the liver healthy. Research studies have provided qualitative evidence regarding the anti-lipidemic properties of kombucha which help reduce the absorption of LDL cholesterol (bad cholesterol) and triglycerides and elevate the levels of HDL (good) cholesterol in the body. B vitamins, particularly vitamin B12, are known to increase energy levels and contribute to overall mental well-being. Also, Iron helps the body to produce more red blood cells, which carry oxygen and nutrients around the body. Also, researchers believe that DSL and the vitamin C in kombucha are the main reasons why it appears to protect the body from cell damage, inflammatory diseases, tumors and overall depression of the immune system. (3) A study found that the glucaric acid in kombucha appeared to reduce the risk of cancer in humans. Are there any negative side effects of consuming it? As you can see kombucha is a healthful drink. However, as with any food or drink, moderation and paying attention to your individual body’s reaction is recommended. There are some possible interactions and side effects to be aware of. These have been found to occur mostly in people with weakened immune systems. Kombucha has a high level of acidity so it can also cause concern for people with digestive problems like stomach ulcers, heartburn, or any sensitivity to acidic foods. In addition, side effects seem to be more of an issue when making homemade kombucha because contamination is possible and the SCOBY disk and the tea itself aren’t subject to quality control like they are when they are produced commercially. To be on the safe side it is recommended the following refrain from consuming kombucha. Kombucha is currently considered the fastest growing product in the functional beverage market with sales estimates of $1.8 billion by 2020. This can be attributed to two large influential actions in the market. Firstly, in 2010 Whole Foods pulled kombucha off the shelves due discovering evidence that the fermentation process of some of the brands produced a significant amount of alcohol. The alcohol content in the beverage appeared to be a percentage that classified it as an alcoholic beverage needing regulation. The publicity in response to this can’t be discredited as a possible source for the widespread intrigue and awareness of kombucha in the years following. Then, in 2016, a popular brand Kevita was acquired by PepsiCo further solidifying the broad reach of the popular beverage and perhaps the easiest explanation for kombucha being found at that random gas station in rural America. 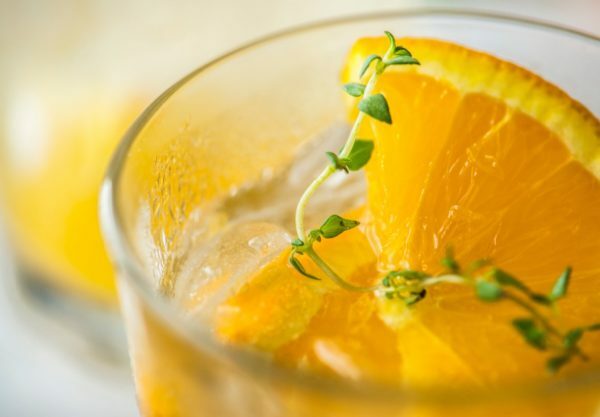 With its significant history and an ever-growing list of studies researching to support its health benefits, this tangy drink isn’t a trend disappearing anytime soon. Kombucha is now a staple in numerous beverage store aisles and, who knows, it might just be proven one day as the fountain of youth they claim it to be. Do you notice any effects when you drink this trendy elixir? Let us know in the comments below. Potential use of D-glucaric acid derivatives in cancer prevention. I love kombucha. I find myself craving it at certain times and then I consume a bottle every day until my body seems to intuitively know that I’ve had enough, at which point I stop drinking it for a while. I have noticed that if I drink too much of it that I bruise more easily and that sometimes comes with increased bleeding gums when flossing. So it likely also has blood thinning capabilities! This goes away when I stop drinking it for a while and then resume in moderation.